What is Product Filtering with Faceted Search? Florida Colors provides the latest technology for our customers. In addition to traditional search methods, we provide Product Filtering, also known as faceted search. It allows shoppers to refine product searches based on multiple attributes such as color, growing habit, in-stock and more. Amazon, eBay, and even non-transaction sites like Yelp all use this technology. It can make a huge impact on ease of use. The product filter appears on the left side of category, brand and search pages in desktop browsers. On a mobile phones, go to any category and after the sub-categories you can click on "show filters" to see all the filter options. Faceted search is the dynamic clustering of items or search results into categories that let users drill into search results (or even skip searching entirely) by any value in any field. Users can “drill down” by selecting specific constraints to the search results. Faceted search is also called faceted browsing, faceted navigation, guided navigation and sometimes parametric search. Florida Colors now provide even more sophisticated tools to help our users find information. 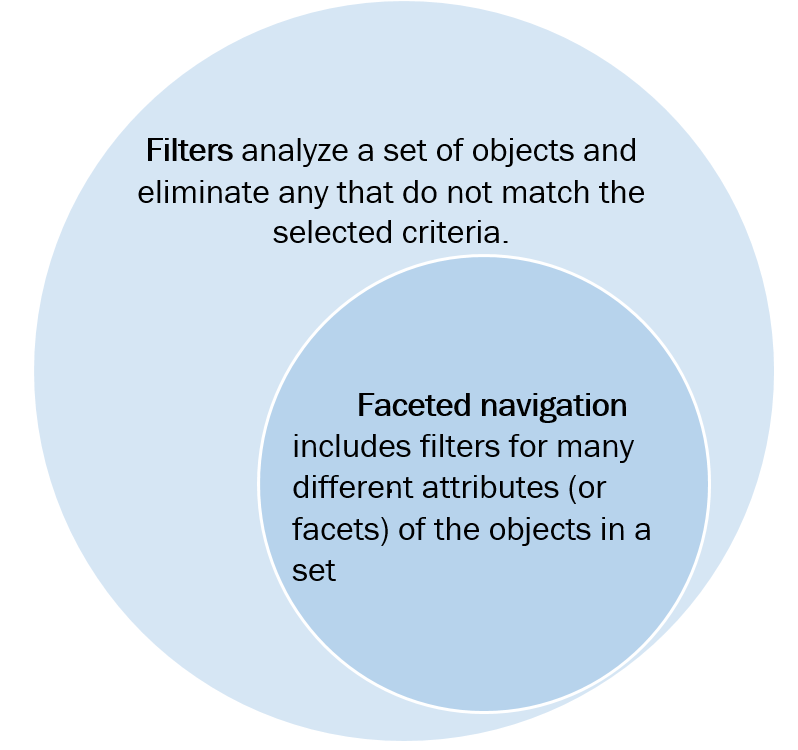 Filters are one such tool — they analyze a given set of content to exclude items that don’t meet certain criteria. More recently, rich information systems have also begun to provide faceted navigation, which basically extends the idea of filters even further into a complex structure that attempts to describe all the different aspects of an object, for maximum flexibility in information retrieval. These two terms — filters and faceted navigation — are sometimes used interchangeably. There is in fact quite a lot of overlap between these concepts: they share the same basic mechanism of analyzing a large set of content and excluding any objects that don’t meet certain criteria. The difference between the two is essentially one of degree, but it is an important difference. Ideally faceted navigation provides multiple filters, one for each different aspect of the content. Faceted navigation is thus more flexible and more useful than systems which provide only one or two different types of filters, especially for extremely large content sets. Because faceted navigation describes many different dimensions of the content, it also provides a structure to help users understand the content space, and give them ideas about what is available and how to search for it.